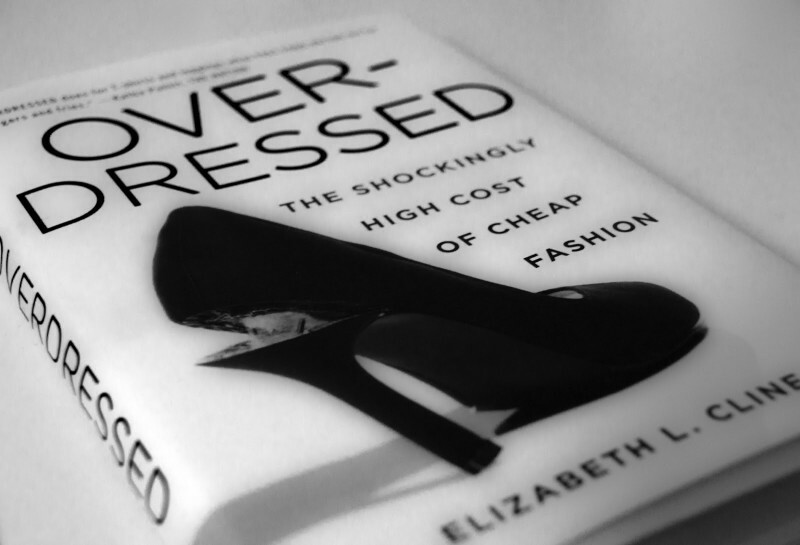 On April 01, we’ll discuss our current book, Overdressed: The Shockingly High Cost of Cheap Fashion by Elizabeth L. Cline. Overdressed has the potential to completely change your understanding of clothing and shopping. To me, it’s required reading for every person in the first world who buys or wears clothing. It turns out that a number of you have already read Overdressed. Anya may have said it best: “Oh! I love that book! I read it a few months ago and couldn’t stop talking about it.” I was a little disappointed that this book wasn’t new to everyone, but mostly I’m happy that so many people liked it. It’s an important book, and the nerd in me gets so excited when we like the same things! 1) Find a copy of Overdressed in bookstores or at your local library. It’s also available for Kindle, Nook, Kobo, and as an Overdrive library ebook (in some regions). 2) Read the book. If you want to chat about it while you’re reading, use the hashtag #colettebookclub on Twitter. 3) Come back to the Colette blog on April 01 to talk about the book and learn which book is next. If you’ve already finished the book and want to learn more, here are some other sources. A small team of radio journalists follow a t-shirt around the world as it gets manufactured—from the farms where the cotton is grown to the used clothing markets in sub-Saharan Africa. Elizabeth Cline continues to cover this issue. Her most recent article looks at a small number of online fashion retailers who are capitalizing on consumers’ desires to purchase clothing that lasts. Thank you to everyone who participated in our February 15 discussion of The Forgotten Seamstress by Liz Trenow. Everyone had their own take on this fast-paced novel. A reader named Piggyflowers compared it to potato chips: tasty but not very nutritious. 2) If you want to see the hand-woven silks that Warner and Son’s designed for the British Royalty, you can actually go visit their archive. 3) This site that has a nice overview of the Warner Archive with some gorgeous samples. 4) The Historic Royal Palace (Kensington Palace, specifically) has an entire collection of wedding dresses, including Princess Mary’s. The Colette Book Club is an online book club that explores the meaning and making of clothing. If you want to recommend a book, email kat@prettyscavenger.com. This is a great topic to cover in a book club. Thanks for the suggestion, I will be looking at my library for a copy to join in. believe it is streaming on Netflix. The message is very similar to that of Overdressed and I thoroughly enjoyed it as well. my links didn’t come through! I’m also really excited to talk about the book with everyone, even though I read it a while back. Thanks for sharing the link to True Cost. I’m going to check it out! I agree with you. The book’s been around for a while, it’s not a new title. Though it’s become very familiar in the sewing world, I do think it’s worth coming back to and definitely worth popularizing further. The book and the problem it explores is not as well-known and understood as it may seem, so I’m really looking forward to the discussion on April 1st. Thanks for the links, Anya. I’ve seen “True Cost” and later stumbled upon, “Sweatshop”, a Norwegian documentary/reality tv series. Here’s a link to episode 1: http://www.aftenposten.no/webtv/#!/video/21032/sweatshop-ep-1-how-many-will-die-here-every-year (There are English subtitles). Thank you for sharing the link to Sweatshop! I will definitely check it out. I’ve been anxiously waiting for my copy to arrive! I ordered it as soon as you posted it for our next book club “meet” but of all things this one is taking quite a while to get here! I look forward to reading it and agree with others who have said it’s a great topic to know about. Just for the record, I’m not a big cloth consumer, i only add two or three items a season, and definitely not have a bursting wardrobe! Pilar, I feel your pain! I have mostly switched to buying second-hand clothing, but I have bought a couple things at H&M since I read this book. I don’t you should feel guilty for the occasional purchase. I feel like the author is more in favor of encouraging mindful consumption. If people’s shopping habits change, then the businesses will have to change how they’re being run. The documentary True Cost is also an excellent suggestion! I will not be able to participate in the April 1st activities, but I want to thank you for choosing this book for discussion. I have loved that this book makes people think about the significance of where they spend their money. It has been awhile since I read it, and I cannot remember if I thought it was well researched or well written because the topic has sort of overwhelmed the delivery vehicle (kinda like: the pizza was awful but CHEESE!). My gripes with Forever 21 and the like have been about their intellectual property thefts (fabric design, not paying designers they hire) and their shoddy treatment of their workers, but abusing the poor and piece workers is a grand tradition in clothing manufacture. It’s just rotten from top to bottom. While it may not be new to everyone, it is still a very valid topic. And because I love the book so much it drew me to joining in on the book discussion! I think I’ve reread the book about 5 times over the years! lol “Overdressed” and books like it inspired me to get back into sewing, because I was getting more than fed up with spending money on things that would fall apart after a couple washes. I am in the middle of this new-to-me book and appreciate its clarity. It certainly makes sense and establishes connections among many trends and events I’ve noticed over the past 30 years. Great choice.